The Large Hadron Collider (LHC) at CERN is the largest man-made machine ever built, and the world's largest particle accelerator. Particle beams in the accelerator travel close to the speed of light in opposite directions, and then are collided together to reveal information about the basic building blocks of matter. The Higgs boson was discovered at the LHC, and scientists there are also investigating topics such as: conditions of the early universe, supersymmetry and dark matter. The subject of this painting originated at a detector of the ATLAS experiment at the LHC, which records data from proton collisions. The painting is of an event called a "pile-up," where multiple collisions happen simultaneously. 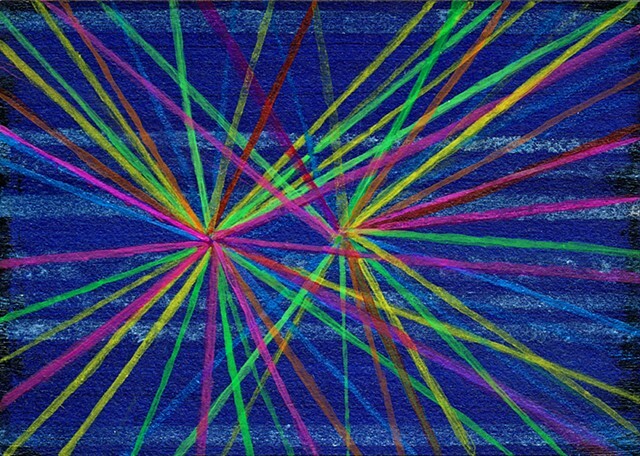 The particle beams resulting from the collision reminded me of abstract art, so I decided to paint them!